Burn Gas Logs instead of firewood with Nickos Chimney Companies wide selection of Hand-Crafted Gas Logs. 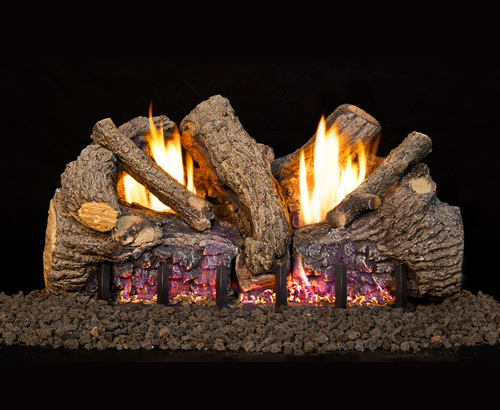 Our naturally sculpted logs showcase intricate bark detail delivering the warmth and beauty of a fire without the soot and dirt. 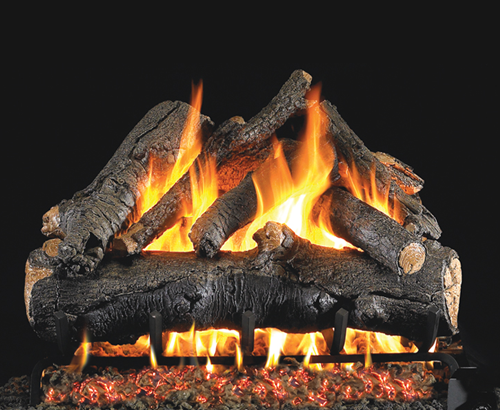 Gas logs deliver low operating cost, yielding a solid economical choice. They are convenient, environmentally friendly and offer on and off operating controls with remote control option. Visit Nickos Chimney Company and see our RealFrye Gas Logs by RH Peterson displays. The authentic look of the fire brings the warm and atmosphere into your home with out the hauling, soot and ashes. Explore the options at RealFyre. Explore the vent-free options at RealFrye. There are times when getting the results you want requires a bit of personal involvement. Our selection of gas burner parts allows you to take your fireplace to the next level – whether indoors or out, we have the parts you need to change your fuel type, assemble your own burner with custom gas logs, and put the final safety touches on the hearth you’ve always wanted.